When you purchase a new car, it comes with a manual with a detailed maintenance schedule for you to follow. And while modern engines are advanced, there are still details that need to be checked on a regular basis. Keeping your car well maintained is the key to preventing breakdowns and expensive repairs. 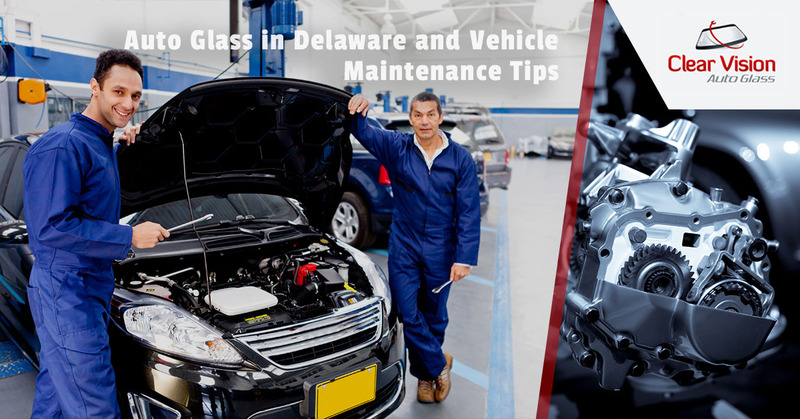 Proper Maintenance includes brake checks, tire inflation checks, oil changes, belt checks and windshield inspection by Clear Vision Auto Glass in Delaware. Here are things that need to be checked on a regular basis. The oil in your engine helps keep everything running smoothly and your car can’t run without the proper level of oil. Checking the oil is easy enough, you could probably do it yourself. It consists of simply pulling the dipstick and determining what the level of oil is. You also need to take your vehicle in for regular oil changes. Oil changes are one of the most basic car maintenance procedures and should not be overlooked. Checking your tire pressure on a regular basis can prevent you from getting a flat tire and will extend the life of your tires. Improperly inflated tires can cause a blowout, which could leave you stranded on the side of the road or put you in a dangerous situation. In addition, the wrong tire pressure can cause you to lose fuel efficiency, which costs you money. It’s not just the pressure of your chores you need to check, the tire tread needs to be checked as well. If you lose too much tread on your tires, your traction is compromised and you could find yourself in a dangerous situation. This is especially bad in icy or other slippery conditions. In addition to examining the tread, you should check your tires for bulges, cracks or any other damage that could cause a problem. The last thing you want to do is wait until your brakes are squeaking before you have them checked. It is even worse to wait until you hear metal scraping on metal before you take your car in for brake repair. At this point, you can expect an expensive brake repair. Not only that, but driving around with brakes that are obviously in need of repair is quite dangerous, to you and to others on the road. By having your brakes checked on a regular basis, you stand to stay safe and save money on expensive repairs. If you notice that your car pulls to one side, you need to get it to a mechanic and have it checked out right away. A car that is out of alignment doesn’t handle as well as it should and you will wear your tires unevenly and severely shorten their lifespan. A light or blinker on your car that does not function is dangerous. Make sure you check all of your lights including blinkers, brake lights and headlights. You should take your car to Clear Vision Auto Glass and have the windshield inspected.